On February 15, 2019 in Kharkiv, 18 active practitioners of conflict transformation in Ukraine received certificates of successful completion of Social Intermediaries School. The studies started on September 17, 2018 and included 200 hours of live educational sessions and individual practical assignments. Final photo of alumni and trainers. Kharkiv, February 15, 2019. Photo by Małgorzata Biczyk. 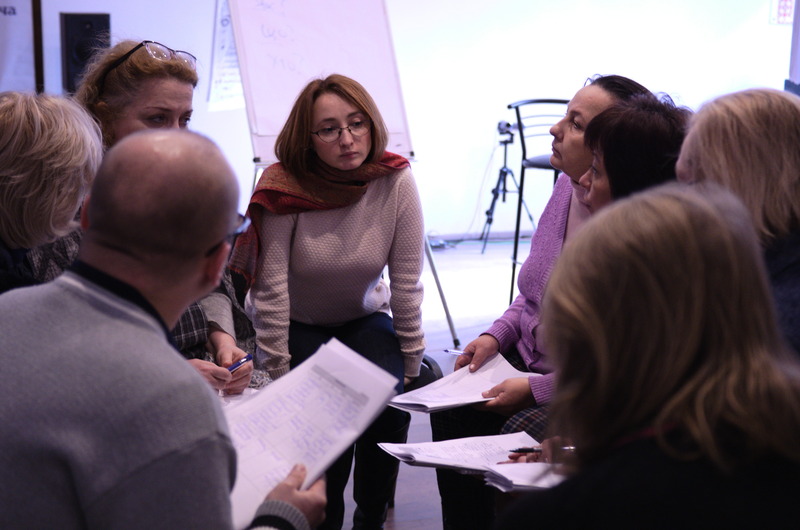 Ukrainian Peacebuilding School defines social intermediary as an expert on preparation and organization of inclusive multi-stakeholder social dialogues in local communities in zones of ongoing or potential violent conflicts. The Social Intermediaries School started in 2015, 115 citizens of Ukraine received certificates of completion so far. Fourth year of Social Intermediaries School was dedicated to conflicts between the groups of citizens and the authorities. 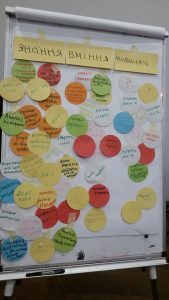 Traditional training modules were complemented by the new ones, created as a result of cooperation with Kurve Wustrow – Centre for Training and Networking in Nonviolent Action – our partner organization from Germany. The School included three 5-day long live training modules, which were conducted in Kharkiv in September and December 2018 and February 2019. Moment of studies. Photo by Małgorzata Biczyk.First module “Conflict Competence” included: Introduction to conflict; Conflict analysis; Conflict structure; Conflict dynamics; Dividers and connectors in conflict; Social networks as human communities; Prospects of peacebuilding in Ukraine – the conflict of concepts. After completion of the module, the students received the practical assignment – they had to analyze real life conflicts. Second module „Conflict management through consultative negotiation practices” included: Management of group processes; Do no harm (local capacities for peace); Risks and opportunities of negotiations; Context of Negotiations; Intermediation as consultative negotiation practice; Shared and consensus decision-making; Role of social intermediaries in information security. After completion of the module, students received the practical assignment – they had to design the groups for common decision-making. Third module “Organization of common decision making” included: Social agreement as a foundation of European culture; Engagement into action, breaking barriers in the conflicts; Project management of negotiation process; Information security in virtual worlds; Force and violence in governance in post-communist societies; European practices of participation in common decision making. 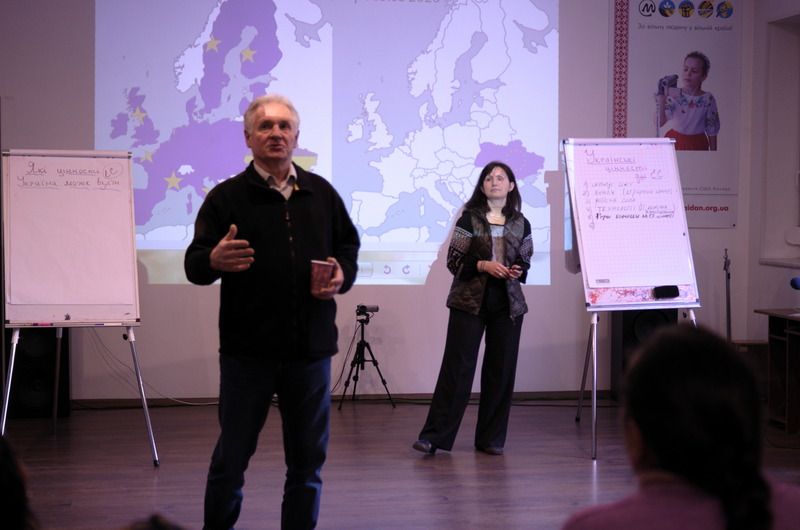 European practices of participation in common decision making – training by Zbigniew Bujak assisted by Ganna Churkina. Photo by Małgorzata Biczyk. 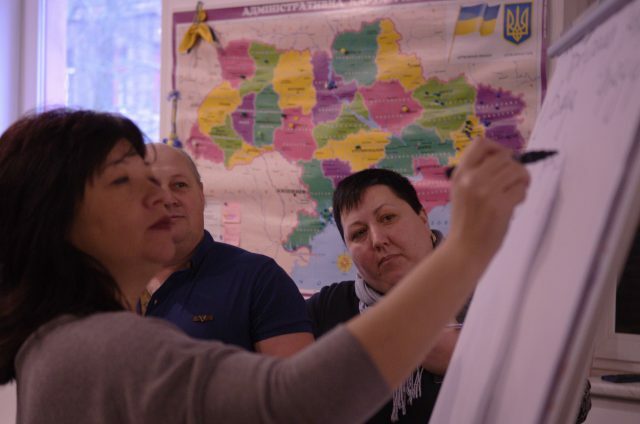 New trainings introduced this year were based on knowledge Ukrainian Peacebuilding School coordinators learnt in Kurve Wustrow – Centre for Training and Networking in Nonviolent Action. Igor Semyvolos participated in Do no harm training of trainers in July 2018. Ganna Churkina and Nataliya Zubar participated in Project management and evaluation training in March and November 2018. These new trainings were met very enthusiastically by the participants, who noted that they will be using the proposed uncommon approach in their work. Both Do no harm and Project management and evaluation trainings were perceived by the students as very structural and organized. Project management training starts with impact chain puzzle. Photo by Nataliya Zubar. 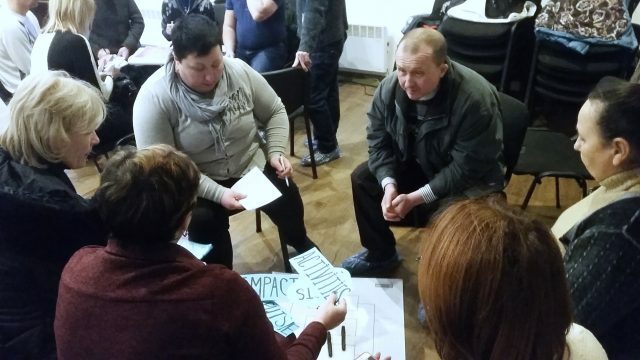 An alumnus of the first year of Social Intermediary School, internally displaced person from Luhansk Olena Znatkova, debuted as a trainer with her own lecture on co-decision making and shared her personal success story as a social intermediary. Olena Znatkova presents her interactive lecture. Photo by Ganna Churkina. 95 people wanted to participate in the School this year, 23 were selected for participation and only 18 students, 12 females and 6 males, had successfully finished the studies. 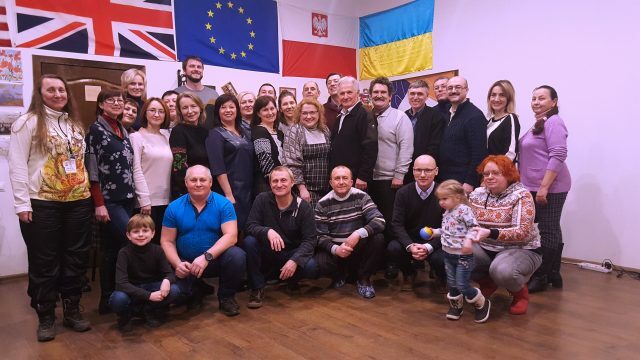 Our alumni represented 13 civil society organizations and 1 local government from Donetsk, Luhansk, Zaporizhzhia, Kherson, Odesa, Kharkiv and Vinnitsia oblasts. Knowledge and skills assessment by the students. Skills. Conflict analysis, Algorithm of planning the changes, Monitoring conflict development; Safe behavior in social networks, Stress management, Moderation techniques, Active listening; Designing communication in conflict, Organization of communication in conflict, Organization of group work, Organization of negotiation processes; Organization of dialogue spaces, Engagement into the common decision making; Organization of common decision making – roundtable, discussion, Fixing negotiated agreements. Several students reported that they already shared the knowledge in their organizations and communities, especially conflict management, project management and information security. A power of school lies not only in studies, but also providing the space for dialogue and networking between different actors including activists and local authorities. The participants got inspired for transforming conflicts in their respectful communities and also to cooperate between each other. Moment of studies. Photo by Małgorzata Biczyk. For example, a head of a village in Donetsk region applied the conflict analysis skills for a typical community resource based conflict, caused by the decentralization reform. She found the deep roots of the conflict, the right actors, analysed possible scenarios. She decided to engage local community into the conflict transformation and as a result the dialogue brought real, palpable effect. Three alumni – an activist, internally displaced person from Luhansk living in Kharkiv, a school principal and a local authority from Donetsk region started cooperation on collecting and sharing the gifts to bring the joy for kids in conflict-affected villages. They called this activity “The chain of kindness”. We will be following their activities and sharing their successes and experiences. In 2018-2019 the Social Intermediaries School is part of the Civil Peace Service program: “Empowerment of civil society for non-violent conflict transformation with state actors – Project-line ‘Platform for (successful) Nonviolent Activism’”. The project is funded by K. Wustrow – Centre for Training and Networking in Nonviolent Action, within the framework of Civil Peace Service, a program of Germany’s Federal Ministry for Economic Cooperation and Development (BMZ). 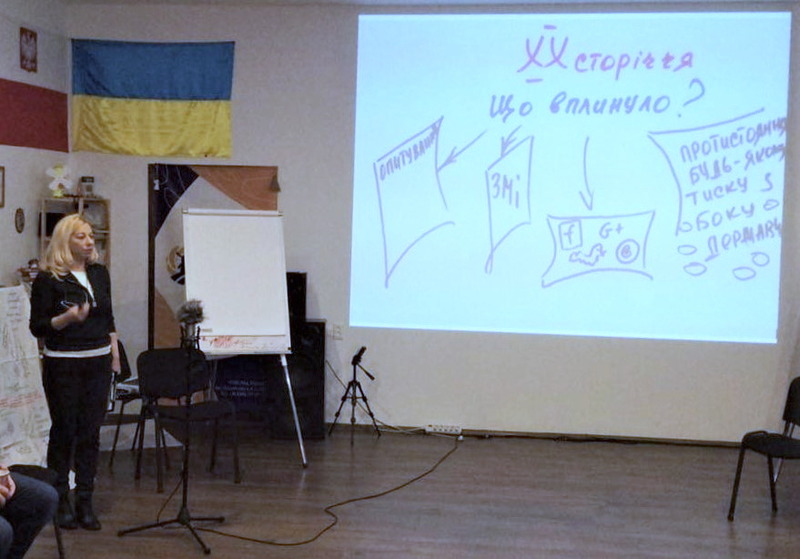 Ukrainian Peacebuilding School™ is a project that is active since September 2014. 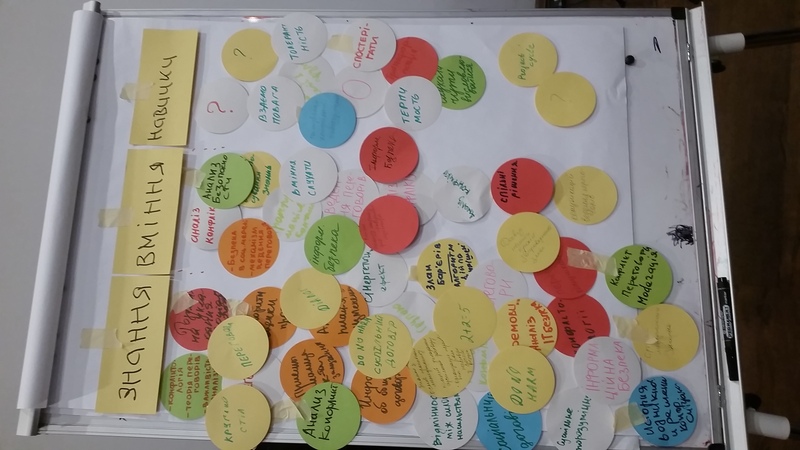 The objective of Ukrainian Peacebuilding School is to organize cooperation between the civil society organizations, local and central government authorities, business, Ukrainian and international experts for conflict management and human development in local communities of Ukraine. Ukrainian Peacebuilding School project is coordinated by two Ukrainian civil society organizations – Association for Middle East Studies (AMES) and Maidan Monitoring Information Center.